More than 80,000 customers on Long Island lost power. It took a couple of days but by Aug. 7 PSEG had restored power to all with the help of some out-of-town utility workers. In Rhode Island, National Grid reported a peak of 121,000 customers without power at the storm’s height. About 23,000 of the utility’s Massachusetts customers lost power too. 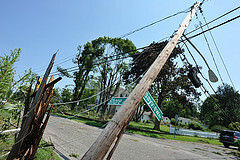 The storm damaged several transmission lines, according to Timothy F. Horan, president of National Grid in Rhode Island. National Grid restored power to most customers in the two states by August 6, with less than 200 in Rhode Island still without power on August 7, mostly due to individual service lines being knocked out by the extensive damage. The Northeast, expecially New York, is one of the areas of the United States most quickly moving into microgrids — but not quickly enough for those this week who who had neither a cold beer nor a hot shower (thank you Amory Lovins). To get a sense of the devastation, see PSEG Long Island’s photos here. Willdan Group won the award for all eight microgrid feasibility studies that it submitted in the $40 million NY Prize contest. The consulting firm worked with the villages of Westfield, Bath, Arcade, Sleepy Hollow, Geneseo and Tarrytown, NY; and the cities of Plattsburgh and Rochester, NY. They were among 83 communities awarded $100,000 in July to conduct community microgrid feasibility studies. The studies mark the first of three phases in the contest. Each phase offers more money to fewer winners. Willdan will work with the local electric and gas distribution companies, municipal governments and stakeholders to ensure the sustained operation of mission-critical facilities such as police and fire stations, schools, and water treatment facilities. In addition to increasing power reliability, the microgrids will seek to increase safety, reduce energy costs, resolve existing system constraints, and reduce dependency on bulk power providers. The study will also analyze integrating key distributed energy resources such as power generators, combined heat and power (CHP) systems, and renewables into the microgrid. Tom Brisbin, CEO of Willdan, also said Mohammad Shahidehpour, director of the Galvin Center for Electricity Innovation at the Illinois Institute of Technology (IIT), now serves on its board. The company also is focusing on recruiting microgrid specialists. Sonnenbatterie, a European smart energy storage provider has selected Ideal Power’s power conversion systems for integration with the commercial Sonnenbatterie system. Sonnenbatterie has placed initial product orders with Ideal Power for delivery in August. The first product from Sonnenbatterie for the North American commercial market is based on a 30kW and 24kWh building block creating energy storage systems from 24kWh to 240kWh. It will be used for demand charge reduction for commercial and industrial customers. Sonnenbatterie provides lithium-ion energy storage systems in Germany for residential customers wanting a reliable system for self-consumption. Sonnenbatterie also offers applications for backup power, enabling energy independence with alternative energy sources to reduce electricity costs for the U.S. market. For commercial customers, Sonnenbatterie’s system will help reduce demand spikes that lead to costly peak load charges and takes advantage of varying tariff rates. Growing Energy Labs (Geli) and Eguana Technologies are partnering on an integrated residential energy storage system. GeLi offers battery energy storage and microgrid control software and Eguana provides power control and conversion technology for distributed energy storage. The companies have signed an agreement to pursue integration of Eguana’s residential AC Battery with the Geli Energy Operating System. As a first step, Eguana’s AC battery now supports installation of the Geli EOS within its enclosure in minutes with no additional hardware, reducing installation time, cost, and space for residential storage solutions. Integrated system functionality includes time-of-use shifting, back-up power, and the ability to participate in grid aggregation services. 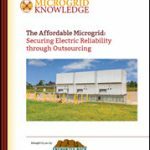 Track microgrid industry news by subscribing to the free Microgrid Knowledge newsletter.